CHICAGO -- Pau Gasol had a turn-back-the-clock moment on Saturday night at the United Center, scoring 46 points and grabbing 18 rebounds to lead the Chicago Bulls to a 97-85 win over the Milwaukee Bucks. The 34-year old Spaniard sank 17 of 30 field goals and 12 of 13 free throws to reach the 40-point plateau for the third time in his decorated career. The 7-foot pivot, who won a pair of titles with the L.A. Lakers in 2009 and 2010, also had three assists and one steal. Thanks largely to Gasol, the Bulls snapped a two-game losing skid even without Derrick Rose, who sat out with knee soreness. The Bulls improved to 26-12, fourth place in the Eastern Conference. "You start making your first couple of shots, your teammates start looking for you, and I was able to find good spots and get in rhythm. I give a lot of credit to my teammates. They made a lot of plays for me and looked for me a lot of times. The coaching staff and Thibs calling out plays for me as well. One of those nights that you just hit shots and make good plays for yourself and your team," Gasol said while addressing the media inside the Bulls locker room. Kirk Hinrich was the only other Bull to in double figures in points with 16. Jimmy Butler only had nine points but dished 10 assists and eight rebounds. Chicago won despite shooting only 39.8 percent from the field (35 of 88) and 23.5 percent above the 3-point arc (4-of-17). Brandon Knight registered 20 points and five assists to pace the Bucks while Jared Dudley added 15 points. O.J. Mayo and Khris Middleton contributed 12 and 11 points, respectively. Despite the debacle, which dropped them to 20-19, the Bucks remained in sixth place in the Eastern Conference. 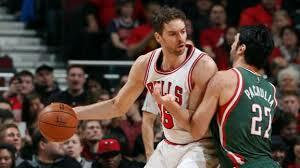 Photo: Pau Gasol (L) manhandled Zaza Pachulia and the rest of the Milwaukee Bucks on Saturday ngiht. Gasol scored a career-high 46 points to lead the Bulls to a 95-87 victory. Click here to view a list of other articles written by Anthony Rozic.